I was a latecomer to shinty because I didn't start playing until I was 18 in 1983. Strachur at Ganavan were short of players and because I was friends with Fraser MacCallum, who had been playing on and off for a year, I was asked to play by his grandfather, Donald MacCallum Snr, and thought I would give it a go. After playing for the Celtic junior team for 18 months, I got a start for the Celtic Seniors and was lucky to have played in the winning Under-21 South Grampian Cup team in Rothesay in 1985 before continuing to play in the centre for Oban Celtic. 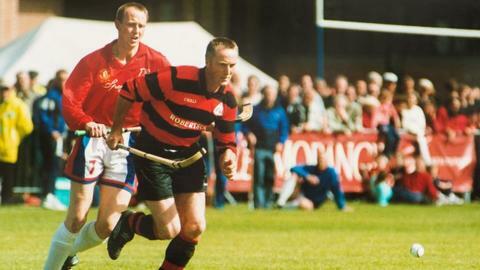 In 1998, I made the very difficult decision to move to Oban Camanachd. Getting older, this was the best decision to further my career and I playing centre there until I retired from playing in 2009. Whilst playing for Oban Camanachd, I won the Celtic Cup once and was runner-up a few times, reached three finals where we were beaten by Kingussie and was proud to be selected to play for Scotland against Ireland in the 2003 shinty-hurling game at Inverness. After stopping playing, I wanted to remain part of the shinty community and started to help coaching first with the Under-14 Oban Camanachd team, then the Under-17s. The Under-14s won the MacMaster Cup twice and the Under-17s managed to get to the McQuistan final in 2014. During the 2015 campaign, I have become assistant coach to Angus Campbell for the Oban Camanachd Senior team and now, due to Angus's departure, I find myself managing the first team. There are 10 games to go in which we need to try and keep our team in the Premier League - so no pressure! I am looking forward to the challenge and am doing my best to keep Oban Camanachd where they deserve to be. At the moment we have quite a few players out with long-term injuries but I am hoping to bring in some young and promising players from Lochside Rovers. Oban Camanachd have a great set-up with Stephen Sloss managing the under-14s team, the under-17s overseen by David McCuish and Scott Buchanan and Gareth Evans in charge of Lochside Rovers so the future looks good. Oban Celtic only have one team at the moment, which is a great shame, but they and shinty as a whole in Oban are competing with other sports such as rugby and football to attract young players. It is so important to keep young children playing shinty and it is up to us to continue to make shinty a game that young boys and girls want to play or we will continue to lose them to other sports. Managers are trying to accommodate players playing others sports and it is not always easy to give everyone a game so Oban Lorne have just started a team this year that was initially set up to give players who were not getting a game for Celtic or Camanachd a chance to play. They are currently in the Second Division South and also have a development under-14 team, which can only be a good thing for the future of Oban shinty. I am the groundsman for Argyll & Bute Council and this can prove to be a challenging job providing Mossfield and Ganavan pitches for all the shinty teams in Oban. There are a lot of sides using the pitch from primary school through to senior level and a ladies team, which started this year. We are currently trying to develop North Connel pitch to help take the pressure off. Preparing Mossfield for the upcoming MacAulay Cup final involves closing the park for four weeks prior to the final for top dressing with sand, re-turfing goal mouths, draining the surface twice, fertilising and cutting the grass. Four weeks later the Camanachd Cup final will also be held at Mossfield so more repairs will be due. Mossfield is not only a shinty park but is used for various sports and concerts and will soon be hosting some Highland Games events. Fingers crossed these "heavyweights" are kind to my park and the weather is in my favour. Though closure of the park can be an inconvenience to clubs and organisations, it is essential this maintenance is done in order to keep Mossfield at a high standard that everyone can use and that it can withstand our "wonderful" west coast weather. Away from shinty, I enjoy spending time with my daughter Rebecca and my long suffering wife Dee, who when she met me 23 years ago knew nothing about shinty and over the years has found if you can't beat them - join them. It is very important we strive to keep shinty a strong force in Oban, our history speaks for itself when you look at the great players that have come from Oban. I hope to continue to play my part as a former player, coach, manager and groundsman in its present and future to ensure shinty will always be a powerful force to be reckoned with and always be an equally attractive sport for young kids to choose.